oOo: Ascension Review – Uniqueness all around! 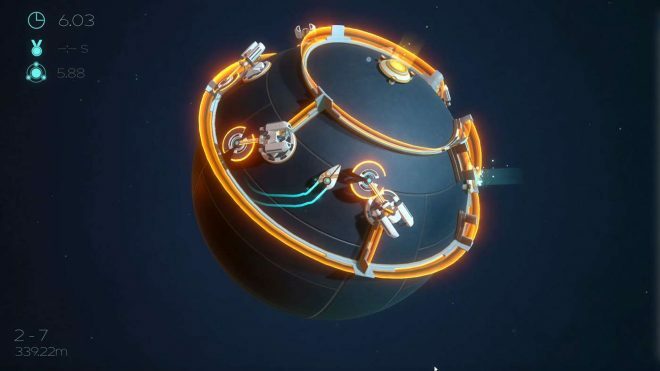 Possibly the most interestingly simple yet still complex game I’ve seen in quite some time comes to us from Developer Extra Mile Studios in the form of oOo: Ascension. At a glance, it can be a little confusing what the game actually is. To put it simply, oOo: Ascension is a fast-paced arcade game with elements based around platforming and racing around a 3D sphere. The game features a classic solo arcade mode but also has local multiplayer that allows you to complete the game with friends and family or challenge them to the best finish times on various levels. A time trial ghost system is also present to aid you with trying to beat your personal best times. The game features nine unique worlds featuring 10 unique levels within each world. From the start, the game may seem very simple. Make it from the orange starting point to the blue finishing point in each level. Granted, for the early levels, this isn’t much of a challenge. 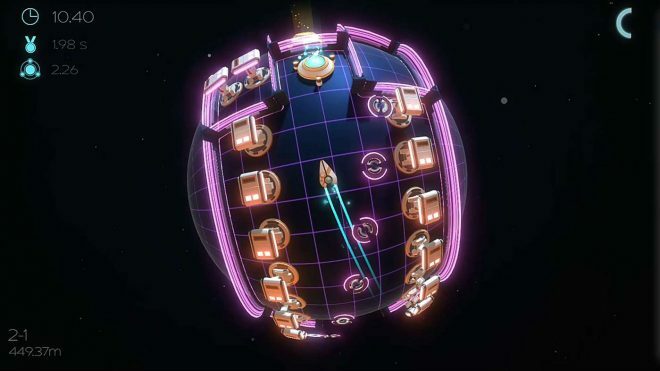 The game quickly starts to introduce various hazards to the game such as spinning blades, blade cannons and lasers that phase in and out just to name a few. The difficulty really starts to bare its teeth when the game begins requiring the player to be more precise with movements by limiting the mobility of platforms. It may sound simple, however, touching anything except switches or the exit point kills you. Some levels will even throw in interesting curveballs requiring you to touch a specific number of switches to activate a moving platform or have you reach one side of the level only to make you turn around and go back. It’s crazy fun. Unique Stages – A lot of games leave you questioning whether or not you’re even making progress in the game, as most the stages you visit look mostly the same. Something oOo: Ascension does best is the uniqueness of its stages. Every world you visit introduces not only a new color theme to the level design but also a new element that you’ll either need to manipulate or that you’ll need to avoid. There’s a lot that’s best left for the surprise, though it is worth noting the most interesting world: world seven. 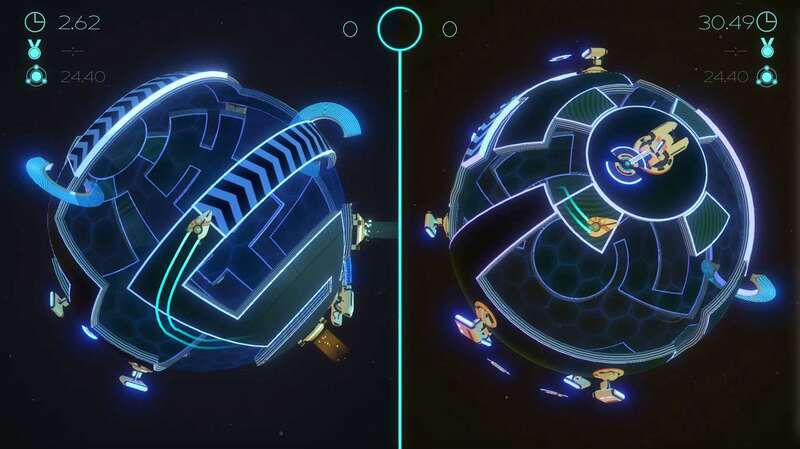 This world bases around manipulating switches to activate gates either nearby or further into the level. After activation of the switch, you’re required to speed across the level past the gate before the switch deactivates. Of course, there are hazards to slow you down or eliminate you altogether. It starts to feel like a marathon of not only speed but death. Fast, Faster, and slow – Let’s be honest, movement in oOo: Ascension can feel a little over-sensitive if you aren’t aware how it works. Control is based solely on how aggressively you press the stick. Pushing fully on the left stick in a specific direction will cause you to move very quickly, sometimes uncontrollably. Pushing lightly will help you to go slower and help you keep control. This system alone is by no means polished. Luckily that’s where the triggers come into play. Holding down the Left trigger while moving the stick will cause the camera to zoom in slowing your character and making them more precise with movement. This helps make the more confined spaces more manageable. Holding down the right trigger while maneuvering the stick will give you a much-needed speed boost. This can be helpful when avoiding specific hazards at various levels. The speed you go is entirely in your control and helps make maneuverability more user-friendly. Back to the Beginning – It might seem a little strange to see this listed as something that someone would like about the game. Whenever and however you die in a level, you’ll immediately start back at the beginning of the level. There are no checkpoints, which aren’t really necessary considering the longest levels are about 1 – 1 ½ minutes. Obviously, it will take different players some time to complete the more difficult levels, as you’ll need to learn how to overcome all the different obstacles. Each and every level is a learn as you go style level. This style is reminiscent of other platforming games like Super Meat Boy (in which you also start back at the beginning of the level). 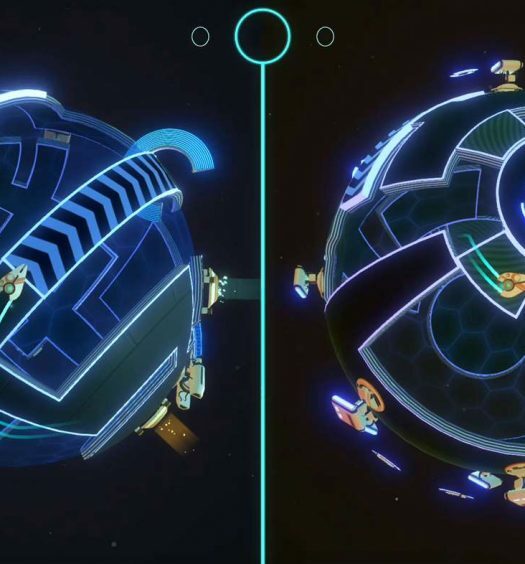 oOo: Ascension levels might seem bigger, but you’re also moving around a 3D sphere. If each level was laid out flat, one would clearly see they are relative to the level size of other platformers levels. Out of Place Boss – oOo: Ascension doesn’t feature any sort of story, which let’s be honest it didn’t really need to. The game, however, still feels the need to feature a strange endgame boss battle. You might not know who you’re fighting or why you are doing it, but the only real question is how to take this enemy down. It may take a few minutes, but eventually, you’ll understand how the battle works. The hard part to this level is evading everything thrown at you. At the start of the fight, you’re pursued by two small white balls with purple lights reminiscent of the cores that GLaDOS drops in Portal. There are also ripples that appear along the ground and disappear shortly after. Once the boss is damaged, you’ll find more hazards start to appear. The boss requires damage six times to be defeated, which means five of the times you damage them, you’ll need to avoid an abundance of different hazards in different waves. It’s doable but extremely frustrating, especially since when you die, you’re required to start the entire battle over. One final, difficult level would have been more satisfying and logical than the boss fight that was included. Distracting Ghost – Your time trial ghost isn’t as big of an issue in the earlier levels, but during some of the later levels, it starts to become more noticeable how distracting it truly is. If you’re playing a level for the first time, you’ll encounter this ghostly version of you every time you have made progress through a level and died. While it’s obvious you’re the more colored version of the two of you, the ghost can be a bit distracting when you’re trying to stay focused on rotating blades or moving platforms. This is simply because the ghost will go everywhere that you went when you were playing your previous run up until the point you died. Unfortunately, the game offers no way to turn the ghost off, so the only means of getting rid of this annoying apparition would be to purposely die right at the very beginning before trying a more serious run. This really is more of a minor complaint, but it’d be lying to say that the ghost hadn’t caused a few deaths here and there mainly because of confusion on which of the two was supposed to be watched. All the unique elements that oOo: Ascension presents really made it feel special. Like more of a refreshing new concept and even an interesting twist on some platforming concepts than we may have seen in the past. The nine worlds the game offers each steadily increase the difficulty little by little and some will find more challenge in one area, while others find it in other areas. For the true thrill seekers out there, the game offers one achievement to get a triple zero rating in every level which occurs by beating the set time for a level. The random boss at the end of the game is a tad incongruous, especially when considering how masterful the rest of the game felt. oOo: Ascension is worth every penny spent. oOo: Ascension was developed and published by Extra Mile Studios. The game released on May 25, 2018, for $14.99. A copy was provided for review purposes.